The design of the children’s medical center the very case when it is required to combine the experience of the design of public institutions and the approach applied to the interiors of rooms for toddlers. Friendliness, convenience, and safety – these are the main criteria that should be guided by the arrangement of medical and recreational facilities for children. It is important to understand that for babies a visit to a doctor is associated with various fears. To visit a health care institution did not provoke child hysteria and protests, designers tend to create a cozy home atmosphere in medical centers. Let the visit to the doctor turn into a kind of game for the baby. The design of the reception area of the children’s medical center fulfills, first of all, the presentation function. The visitor should immediately understand where the reception desk is located. The ideal is the design of the medical center, which already at the entrance inspires confidence in visitors. Patients should be confident that they will receive first-class care and treatment in accordance with modern technology. Agree that the reception area designed in the spirit of the Soviet hospital can hardly cope with such tasks. In the recent project of the interior of the children’s medical center, designers of the decorate the reception desk in a marine style. Reminiscent of drawing chalk on the asphalt classics at the entrance brings in the design elements of the game. And the reception desk, stylized under the ship’s board, creates adventure motives. In the design of the reception area, simple but high-quality finishing materials are used: wood, concrete, brick. This finish is highly wear-resistant, which is especially important for rooms with high traffic. For the interior was chosen a beige-brown range, diluted with blue accents. A mustard chair next to the column creates an extra waiting room. 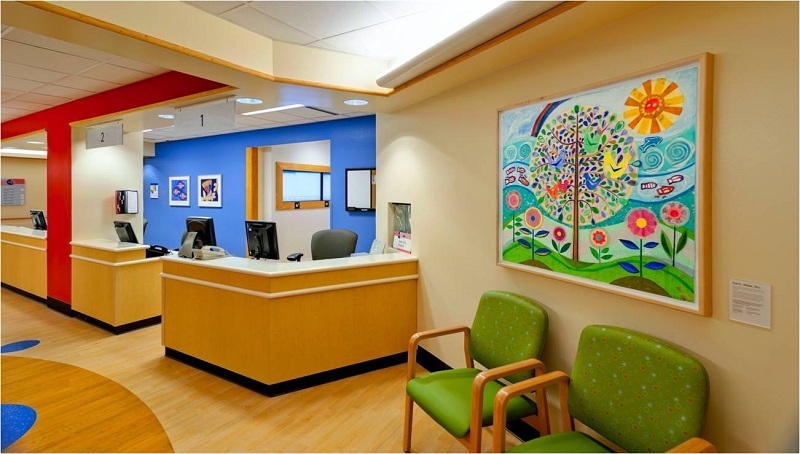 And here is another example of the interior of the reception area in the children’s medical center. The white color base is diluted here with rich green colors. Wall painting with a picture of the reserved forest creates a soothing atmosphere. An interesting solution is the built-in white wardrobe in the form of a house, which becomes part of the artistic composition. Gambling in a children’s medical center is a necessity, not an excess. Here, children will always find something to do, while adults communicate with a doctor, wait for the results of the studies. The design presented in the photo gaming in the medical center is an example of successful zoning. Please note that from the waiting area the game separates the transparent partition. Due to this, the parent will be able, while in the waiting room, to observe his child. The game is divided into a sports corner with a Swedish wall, a rope and a man and a zone for creative pursuits, where children’s tables and chairs are installed. Shelving in the form of a house will accommodate books, toys, and objects for creativity. On a white brick wall, there is a place for children’s drawings. The color basis, chosen for this design project, is distinguished by neutrality. The design of the waiting area in the children’s medical center, the project of which was designed solved in a modern style. The brickwork on the wall brings to the room the loft motifs, which are supported by the ceiling beams. The purpose of the premises is to focus on comfortable recreation areas. Therefore, the main attention was paid to finding comfortable and comfortable upholstered furniture. Mustard and blue armchairs in the style of the 60’s enliven the space where the shades of natural wood dominate. 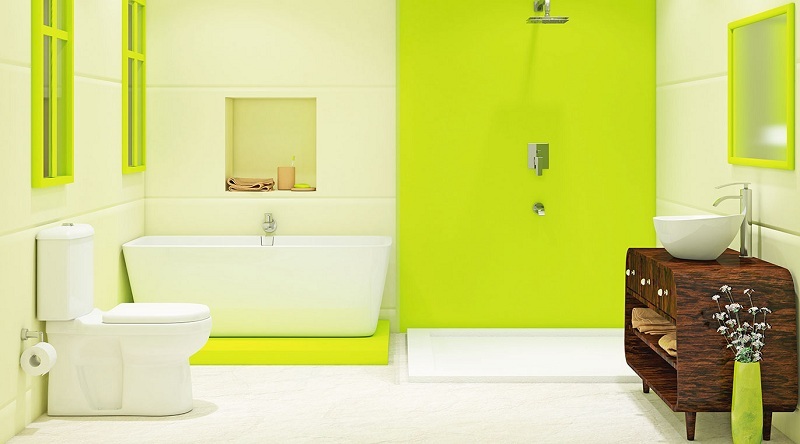 In the interior of the bathroom in the children’s medical center, you can afford various color experiments. For convenience, it is necessary to install not only standard plumbing but also a children’s toilet. To make it easier for babies to wash the handles, the sink can be fixed at a low level. For the interior of the bathroom in the children’s medical center, designers offered two options for registration. The first solution with the use of brown-blue shades is interesting for its mural painting with seagulls. In the second version of the interior of the bathroom in the children’s medical center, the laminate or parquet in the floor finish is replaced with a tile. This is dominated by light green tones, and drawings on the walls seem to be borrowed from the pages of a children’s book. Each room in the institution corresponds to its purpose, but the zones and cabinets do not look separated, all together they work for the unity of design. The careful disguise of medical instruments. Children react very sharply to diagnostic equipment and unfamiliar objects. Therefore, all the instruments in the doctors’ offices should be removed. This will avoid unnecessary whims and not provoke the child of extra fears. Almost all children are characterized by increased mobility. It is difficult for them to sit still while their parents discuss important questions with the doctors. Therefore, when developing the design of a children’s medical center, it is important to ensure that children can move freely along the corridors without risk of accidentally stumbling on sharp corners or slipping on a slippery floor. In the doctors’ offices, one can even think about soft floor coverings, providing comfort and safety. Of course, the elements of decoration and furniture must be made of environmentally friendly materials. Please note that in the market now there are wallpapers, and paints, designed specifically for the repair of premises for children. 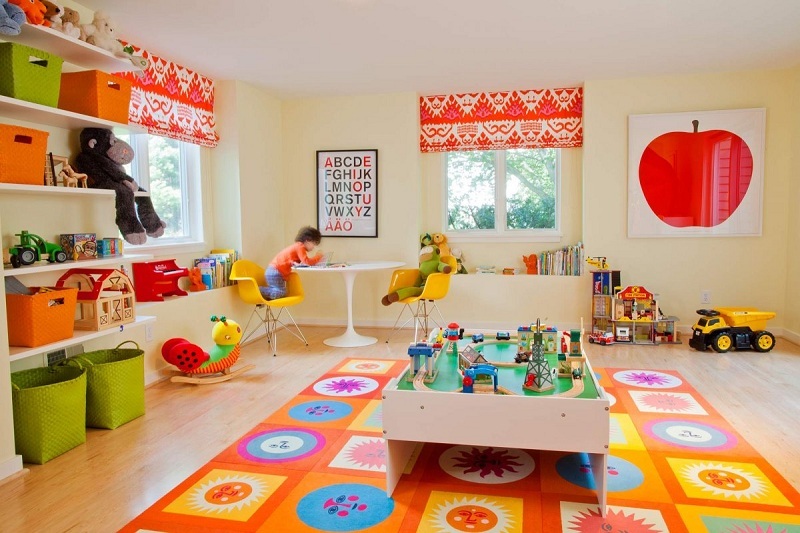 A large number of objects that attract the attention of the child: wall painting, toys, posters, books, and paintings. Visiting a doctor should remind a toddler of an exciting adventure, and not be an unpleasant routine necessity. Toys will not be superfluous, not only in the waiting area but also in the offices of specialists. If the child begins to be capricious, it can be distracted. 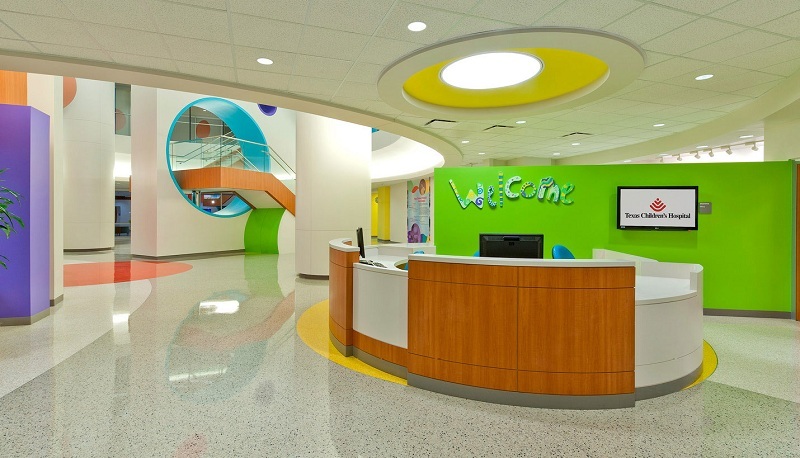 When designing the interior design of a children’s medical center, it is important to take into account the interests of not only visitors but also employees. Therefore, the cabinets should be comfortable for medical personnel, providing them with safe working conditions. If the area of the institution allows, it is possible to provide separate rooms for employees to rest and snack.